New contact photo views + a keyboard shortcut guide! 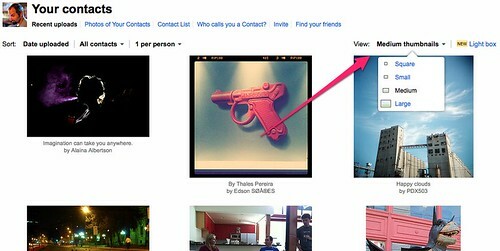 Today we’re launching a couple improvements to the Flickr experience. More views for your contacts recent uploads page and giving you a way to see all the shortcuts with the press of a button. The first part of today’s launch adds a lot of new features to the Recent Uploads from your Contacts page. 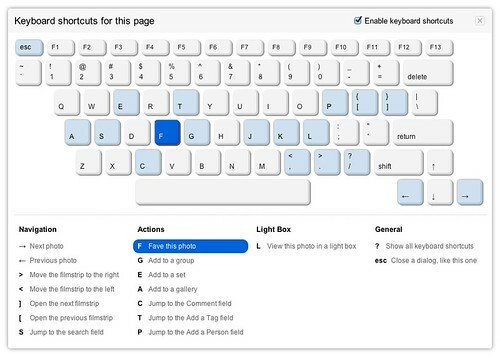 Over the last year, we’ve been hard at work adding keyboard shortcuts to commonly used actions on the site. The photo page redesign alone introduced over a dozen shortcuts to make it easier to do things like navigate through a photostream and add a photo to your faves. Different shortcuts are available on different pages (i.e. the photo page, a set page, photostream) and we show the shortcuts available for the page you are on. Fancy! * No need to hold ‘Shift’ when you press ?. Just press it and we’ll give you the guide. If you have any feedback or have found a bug with the new shortcut guide let us know in the forum. Delve into more of Belgian artist Arne Quinze‘s stunning open-air installations. Photos from yno, haveacupoftea, xof2328, and countries in colors.